The FAU Libraries, serving more than 30,000 students in Boca Raton, Jupiter, Harbor Branch, Fort Lauderdale, and Davie, are on the move. Under the leadership of Dean Carol Hixson, who began her tenure at FAU in August 2015, the new vision for the FAU Libraries is student-focused, with proactive engagement across the University and the broader community. While access to scholarly content and effective use of it remains foundational, the Libraries are also focusing on new and enhanced services, with the expectation that some services will be delivered without the need for users to enter one of our physical spaces. The Libraries are moving to a just-in-time rather than a just-in-case service model to enable the library faculty and staff to undertake new initiatives without compromising essential legacy services. The new Administrative team of the FAU Libraries consists of the Dean and three Assistant Deans, supported by the department heads who serve on the Libraries’ Leadership Team. The Leadership Team meets monthly to review issues and proposals and set policies. 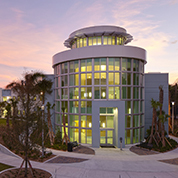 In the past two years, the Libraries have been focused on a strategic overhaul of our physical and virtual spaces in order to meet the needs of FAU’s students and faculty. Website redesign is being rolled out in 2018. 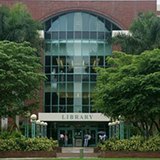 Space utilization is a major area of emphasis, especially in the aging main Wimberly Library on the Boca Raton campus. The Space Allocation Committee has overseen efforts to reduce the footprint of physical collections and consolidate staff offices in order to open up more individual and group study spaces for the very busy facility. Major achievements have been the creation of a Graduate Student Study Lounge, the redesign of the main lobby with FAU branding and new furnishings, the upgrading of one of the Wimberly Library’s three computer labs, the opening of the 100-plus-seat fifth-floor study lounge with adjoining upgraded conference and meeting space, and the creation of new single point of service in the first-floor lobby. Changes to physical space go hand-in-hand with changes to the service model. 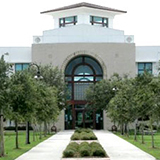 Within the FAU Libraries, many departments are in the midst of reviewing and modifying their services. A recently created position of Scholarly Communication Director and the development of academic and non-academic liaisons signal a more active approach to engaging with and leading the FAU community. A new culture emphasizing broad collaboration, open communication, and individual and group accountability is taking hold, relying on assessment data and direct interaction with library users to inform and guide the Libraries. Much remains to be done but there is a sense of purpose and excitement as the faculty and staff of the FAU Libraries are united in their dedication to our students, the faculty, and the broader community of which we are a part.